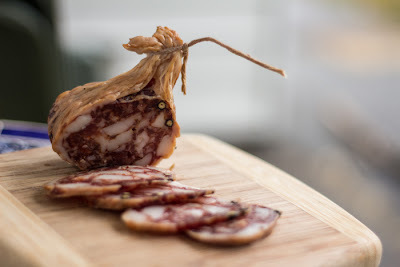 So back at the start of November I made my first batch of salami cured in a casing made of caul fat, the web-like membrane surrounding a pig's internal organs. Inspired by Indianapolis' Smoking Goose, I found the idea of using caul fat as a casing really innovating. Now, each of these salami's only weighs about 6-8 oz, but I think they look much longer to cure because of their ovoid shape. Whereas a similar straight salami has a lot more surface area to dry, these salami's have a thick core that takes time to become sufficiently dry. But I think the wait was more than worth it! 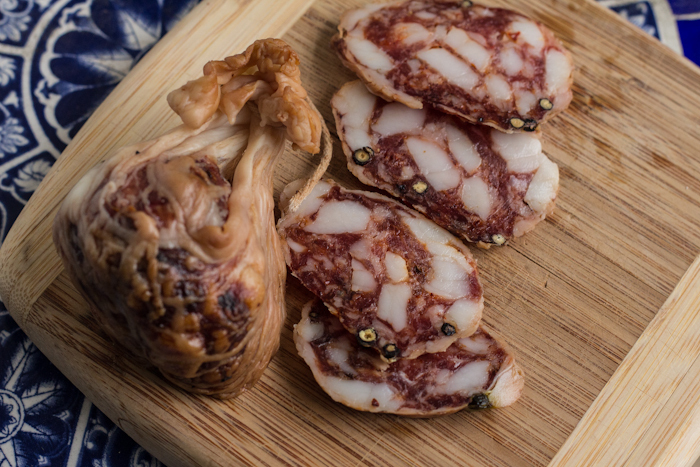 Gently smokey, with a rich, savory cured flavor, and a small hint of heat from the chilies. As the old chestnut goes, your first bite is with your eyes, and I keep thinking these look like big pork figs. So I'm thinking it would be fun to pair these with a dried fig mustard, or a spicy Italian fig mostarda. - The kitchen aid mixer does not have a grinder plate large enough to keep the fat in sufficiently large enough pieces. - When the fat and meat get put in the casing, the auger of the kitchen aid stuffer rekneads them, further working the fat. So this time I decided to dice by hand, leaving me with some slightly too big cubes of fat. But it's like in target shooting - your first shot's too low, you correct and go too high, and then finally you sight in and hit your mark.